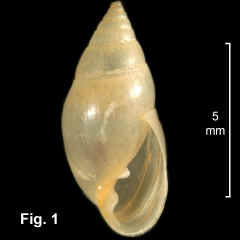 Description: Shell elongate, particularly so for an ellobiid, spire of about 6 whorls, aperture about 45% of shell length. Spire weakly convex, whorls well rounded. Surface smooth. Aperture fairly broad, with (usually) 2 or (occasionally) 3 folds on inner lip. Outer lip thin, smooth internally, sometimes weakly reflected outwards. Umbilicus absent. Colour translucent fawn, becoming opaque fawn with age. Size: Of the available specimens, up to 10 mm in length. Distribution: This is a European species, which has been introduced to at least North America, West Indies, South Africa, New Zealand and Australia. In Australia it is known from the Sydney region of NSW and from Vic, Tas, SA and south-western WA. Habitat: "On mud flats behind and among mangroves in upper littoral" (Ponder et al. 2000). Uncommon in NSW. Synonymy: In Australian literature this species has been known as Alexia meridionalis Brazier, 1877 and Marinula meridionalis (Brazier, 1877). WoRMS (World Register of Marine Species) lists 29 other synonyms! Remarks: Climo (1982) discussed the occurrence of the species in Australia. He was of the opinion that it was first introduced on the hull or deck cargo of wooden ships in the 19th and early 20th centuries. Fig. 1: 7362-1 Leven River, Tasmania (C.263464).